Green Grandma: Sleep Zzz Pillows -- do they really make bedtime easier? Disclosure: This is a sponsored post. I received a Sleep Zzz Pillow at no charge to me in exchange for an honest review. Awhile back, I wrote a post about the Sleep Zzz Pillow and how I couldn't wait to try it. Well, they sent me a pillow, but it was a child's size, so I didn't get to try it after all. But two of my grandbabies did. First of all, let me specify that the Sleep Zzz Pillows are manufactured for children 3 years and older. While one of my grandchildren is especially small for her age, she is over 3. She's the one I thought would benefit most from the pillow, as my daughter and her husband have a hard time keeping her in bed at night. Unfortunately, after a few weeks of trying, the Sleep Zzz Pillow failed to achieve that. 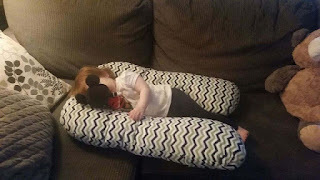 While she likes cuddling up with the super-soft and comfy pillow, it does not lull her in lala land. Her determined little 3 YO mind dictates whether or not she'll stay in bed and no amount of comfy-ness is going to affect her otherwise. Period. I really don't blame the pillow, although it is one of their sales points -- that the pillow makes for quicker and easier bedtimes. In our experience, that simply isn't the case. She does, however, enjoy watching TV on the couch with the pillow wrapped safely around her. How cute is this? 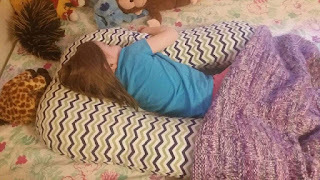 Her big sister, who will be 5 soon, takes turns sleeping with the pillow and she loves it. Look how cozy she is. Basically, I really like the Sleep Zzz Pillow. It just doesn't live up to its claim that it will make bedtime easier. Now, if we're talking the adult-sized pillow, it just might! Can't you imagine yourself wrapped up in one of these? The covers come in a variety of colors and patterns and are amazingly soft. I seriously just wanted to pet it. And here's something really cool -- they're offering my readers (that's YOU!) a $5 OFF Coupon. Just click here to order and enter the code SLEEPY at check out. It's a good deal. Wishing you and your children a good night's sleep. People Footwear Giveaway! Over $100 value! Free shipping on Dr. Jacobs Naturals! Hop to it! Giveaway hop with Earth Mama Organics!